Zoe Osborn as Merlin and Michael Gaunt as King Vortigern. Myths and legends can hold more truth than any history book, according to Geoffrey of Monmouth, the 12th century monk who first wrote down the story of young Merlin, the boy who became his own legend and mentor to the great King Arthur Pendragon. 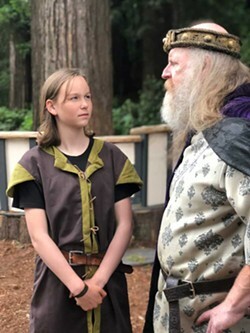 The latest retelling of this many-layered story, The Legend of Young Merlin by local author and actor Pam Service, is presented by Plays in the Park at Redwood Park and remains just as relevant in today's social media-driven world. We first meet young Merlin (a sensitive and nuanced performance by Zoe Osborn) deep in conversation with a snake. Merlin is deeply envious of the snake because it appears to know exactly what it is and its role in the world; he, on the other hand, feels quite lost. He's aware on some level that he is very different from the other children in the village — a boy who sees things they can't and doesn't even know who his father is. To them, Merlin is just "weird" so they mock him mercilessly and don't let him in on their games. These village kids are an assertive lot, little different from today's schoolyard and social media cliques (and just as bent on excluding anyone perceived as "different"). Led by bully Brutius (a confident Aubrey Deuel), their ranks include sassy Blothwyn (Willow Osborn, brimming with self-assurance) and her older brother Trevor (Andrew Deuel), gentle Genny (a quietly effective Virginia Service-Gaunt) and mild-mannered Owen (Robert Service-Gaunt). As Merlin and his serpentine friend retreat from the other children's hostility to their private world, the village world is about to be turned upside down. King Vortigern of England (a gullibly autocratic Michael Gaunt) has invaded the area and is looking for a way to secure his latest land grab. His sycophantic court wizards Nightshade (the always impressive Pam Service) and Wormwood (a delightfully daffy Ed Munn) are tasked with making this determination — a tough challenge, given that their experience with prediction is largely limited to scamming peasants at village fairs. Supporting the King's endeavors are a rueful Captain (Scott Osborn in a convincing stiff-upper-lip portrayal), and a pair of numskull soldiers (James Wright and Bo Banducci) who one feels would be more at home on the comedy circuit than on the front lines of a territorial battle. Both actors ham up their caricature roles in time-honored fashion, recalling the classic slapstick double acts of Abbot and Costello and Laurel and Hardy, even developing their own instantly recognizable catchphrases. Merlin, meanwhile, is unable to shake off a terrible feeling of impending doom and begs his mother (a devoted and protective Kathy Marks) to tell him who his father is, so convinced is he that this will help him better understand who he is and how to deal with his fears. But she is steadfast in her belief that her son must use his own resources to figure out his place in the world — that who he's related to should make no difference. Matters come to a head when the king's efforts to build a fortress right on the mountain are undermined by the repeated disappearance of construction materials. Summoned to solve the mystery, the wizards once more throw their visionary bones, desperately hoping to avoid a fate worse than death. Luckily for them, but potentially less so for Merlin, the bones predict that a fatherless boy is the key to their redemption. Alex Service, in her dual role as director and narrator, keeps the story rolling along at a fast enough pace to keep children and adults engaged without losing the opportunity to communicate important messages about having confidence in your own true self. Sara Krause has come up with some amazing costumes — especially for the wizards — and properties, and also handles stage management. Artistic direction is by Charlie Heinberg, who also contributed to set construction with Brian Butler and Kelly Hughes. The Legend of Young Merlin is truly a family production, with three generations of Service and Gaunt family members and two generations of Osborns. But make no mistake, this is not a production where being a family member gets you a free ride — everyone in the cast pulls his or her weight, and no one gets a pass. It's a timely tale in which anyone of any age can find meaning and relevance — and have a lot of fun along the way. 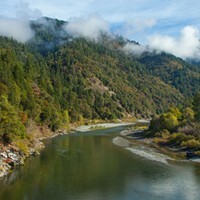 But be sure to wrap up warm as it can get chilly under the redwoods, even at two o'clock on a summer's afternoon. 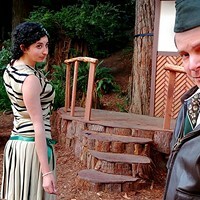 Plays in the Park presents The Legend of Young Merlin in Redwood Park for free on Sundays at 2 p.m. through Aug. 12. Wilde and witty The Importance of Being Ernest plays at the North Coast Repertory Theatre on Fridays and Saturdays at 8 p.m. through Aug. 4. For more information, call 442-NCRT or visit www.ncrt.net. The Van Duzer Theatre hosts 80 cast members from Munchkins to flying monkeys for Humboldt Light Opera Company's The Wizard of Oz Aug. 3-19. 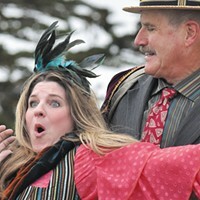 Performances are Fridays and Saturdays at 7:30 p.m. and Sundays at 2 p.m. Call 630-5013 or visit www.hloc.org.